The Fisher Scientific Isotemp General Purpose Freezer fills your basic lab freezer needs. This steady laboratory upright freezer is efficient, and ideal for situations where extreme precision and control aren’t necessary. This 20.9 cu. ft. lab freezer has a temperature range of -12° to -20°C, and uses 100% CFC-free R134a refrigerant with foamed in place polyurethane insulation. This single compartment lab freezer storage arrangement consists of 4 fixed height shelves, and one single hinged door with 6 shelves. The exterior is steel finished with an epoxy coating that resists corrosion and is easy to clean up with an ABS plastic interior. 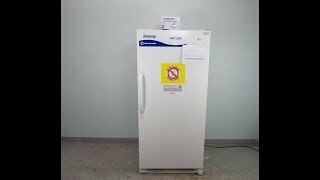 This Fisher Scientific Isotemp General-Purpose Freezer -20C has been thoroughly inspected and is performing to expectations. All of our lab equipment comes backed with our standard warranty. Should you have any questions please don't hesitate to contact us.